1. The competition prize includes two tickets to MBFF Brisbane, Wednesday 30th August 2017. Two complimentary SACHA DRAKE dresses up to the value of $259 (each) for the winner and their chosen friend. The opportunity to meet the talent, and designer Sacha Drake at MBFF Brisbane. 2. These terms and conditions form part of your entry to the competition. Entry into the competition is deemed acceptance of these Terms and Conditions. 4. SACHA DRAKE reserves the right to extend, withdraw or cancel the competition or amend these Terms and Conditions at its own discretion without any obligation to compensate entrants. 6. In order to enter the competition, you must enter your details into the SACHA DRAKE database via the link provided by the talent. Entrants are limited to one entry and must fill in all mandatory fields in the competition form. 7. All entries must include the correct contact details including name, email, phone number, address and DOB. This information will be used to contact you should you be successful. 8. Employees (and their immediate family) of the Promoter and related body corporates of the Promoter are not eligible to enter this competition. 9. The winner will be contacted via email or phone on Friday morning, 25th August 2017. The winner must confirm their acceptance of the ‘‘Win a Double Pass to MBFF” by COB Friday, 25th August 2017. 10. 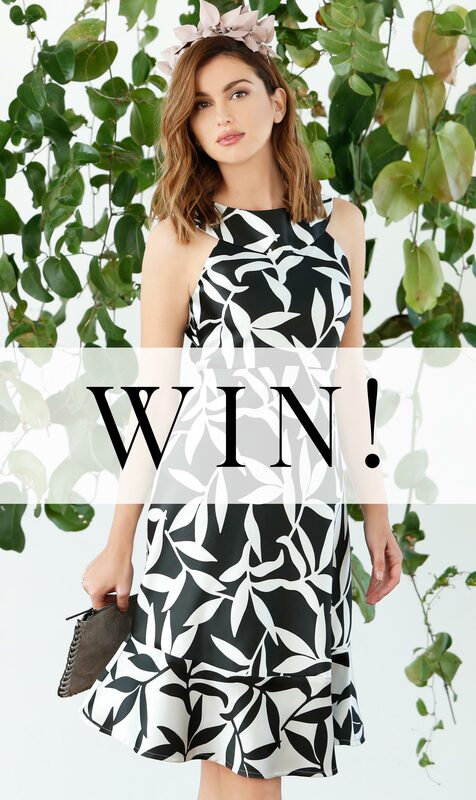 The competition prize must be redeemed at the SACHA DRAKE Flagship Store in Carindale, Brisbane. The winner and friend can choose any ONE SACHA DRAKE item up to the value of $259 (each). This value is not transferable to other items, and any remaining balance cannot be refunded. If the winner or friend is to choose a dress over the value of $259 the difference must be paid in-store. 11. The winner must redeem their prize in person, in-store, and prior to the MBFF event on Wednesday 30th August, 2017. This includes the two tickets to MBFF Brisbane. 12. There will be no refunds or exchanges available after the prize has been redeemed for any reason. 14. By entering this competition you agree to provide the following information to SACHA DRAKE and the talent. Name, email, phone number, address and DOB. This information will be held confidentially and only shared between SACHA DRAKE and the respective talent. 15. One entry per person. All entrants must be over 18 years of age and be an Australian Citizen. 16. Should the winner be from interstate, SACHA DRAKE accepts no responsibility for flights and/or accommodation. 17. SACHA DRAKE shall not be liable for any loss or damage whatsoever which is suffered (including but not limited to indirect or consequential loss) or for any personal injury suffered or sustained in connection with any prize/s except for any liability which cannot be excluded by law. The Promoter is not responsible for any incorrect or inaccurate information, either caused by the entrant or for any of the equipment or programming associated with, or utilised in this competition, or for any technical error, or any combination thereof that may occur in the course of the administration of this competition, including any omission, interruption, deletion, defect, delay in operation or transmission, communications line or telephone, mobile or satellite failure, theft or destruction or unauthorised access to, or alteration of, entries, and reserves the right to take any action that may be available. 18. If for any reason, this competition is not capable of running as planned, including due to infection by computer virus, bugs, tampering, unauthorised intervention, fraud, technical failures or any other causes beyond the reasonable control of the Promoter, which corrupt or affect the administration, security, fairness, integrity or proper conduct of this promotion, the Promoter reserves the right, in its sole discretion, to disqualify any individual who tampers with the entry process, take any action that may be available and to cancel, terminate, modify or suspend the competition subject to any written directions given under State Legislation. 19. Once prizes have left the SACHA DRAKE premises, SACHA DRAKE and their associated agencies take no responsibility for prizes damaged, delayed or lost in transit. 20. SACHA DRAKE reserves the right, in its sole discretion, to disqualify any individual who they have reason to believe has breached any of these conditions, or engaged in any unlawful or other improper misconduct calculated to jeopardise the fair and proper conduct of the promotion. The Promoter’s legal rights to recover damages or other compensation from such an offender are reserved. 23. SACHA DRAKE and the talent will use entrants’ personal information for promotional purposes relating to this competition and for general advertising and promotional services (including adding entrants to the Promoter’s databases and/or mailing lists).